By Álvaro Díez - PhD candidate. Why do we use time zones? The world is a big place and it has many different time zones, so many that is almost impossible to keep track of all of them. That's why this time zones converter (or world clock converter) is such a useful tool, it allows you to calculate any date and time in any time zone - no matter what time zone you are interested in. Now, let's dig a bit deeper into the different time zones. Many might be asking this question, and we think it's important to answer it to at least make a point for the use of the time zones converter. There are many ways in which we can keep track of time. Computers deal with time using what is called Unix time or epoch time, which basically means counting seconds from a fixed date and time, as we have explained in depth in the Unix time converter. Another way of timekeeping could be counting days instead of seconds, like what you can do with the day counter but that leads to the question of how do you define a day. Historically, the way we humans have kept track of the date and time has been by looking at the sky. The date was more or less given by the apparent movement of the stars in the sky, whilst the time was taken by looking at the sun. The movement of the sun in the sky is periodic, so a complete rotation of the sun (in reality this movement is due to the Earth spinning and not the sun moving) takes what we call a day; by dividing that period of time by 24, we get hours. From this, one could tell the time by just looking at the sun and its position in the sky. In reality, the Earth is round which means that the position of the sun at a given time depends on our position on the Earth. In an attempt to organize this difference while still keep a certain relation between the date and time with the position of the sun in the sky, the time zones were born. The world time zones try to group areas with the same solar time and give them a common date and time. Changes in "clock-time" are done abruptly in 1h steps around the globe according to the position of the country, avoiding to have millions of time zones with very small differences between them. In reality, there are country borders, politics and economic interests and fights, which means that not all countries actually keep their geographical time zone and some even made their own with half an hour difference. All in all, this is a universally accepted and very effective way to coordinate the entire world despite the differences in solar time. As we will see next, the most important time zone is the UTC time zone, which is the reference point for all other time zones. The rest of the time zones, be them American time zones, European time zones, Asian time zones... are always referred to and defined by the time difference with respect to the UTC time zone. Look for New York time zone abbreviation in the text below. Input the date and time we want to convert from into the box labeled EST (American time zone corresponding to New York time zone). Look for UTC time zone where the answer will be already displayed. It is not easy to memorize all abbreviations for each of the world time zones and what cities and countries belong to which time zone; but, luckily for you, this knowledge is not required because we have compiled a list with all time zones available in this world clock converter. In addition to the list of all the world time zones, we included some comments and major cities in each of the time zones, as well as a world time zones map for further reference in case you need it. Time zones are, as we said previously, geographical areas with less than 1h difference in their solar time. At least that's the ideal case; in reality, the world time zones map is more complicated and requires a longer explanation. Let's start by the naming conventions. There are 3 basic ways to name each time zone: by their time difference with respect to GMT or UTC time zone; the military nomenclature, that uses the letters of the alphabet; and the 'standard' abbreviations, which are 3 letters representing the official name (or names) that someone has given to the time zone. Despite it being the messiest, the 'standard' abbreviations are the most common ones including some that you might be familiar with such as the American time zones CST, PST, EST; the Europeans CET and GMT/UTC time zone... We will dive deeper into all the abbreviations in the next sections. On the other side of the spectrum, we have the very logical (almost robotic) military zones and time difference nomenclature that easily give an idea of the geographical location of the time zone but contain no information about the countries or cities that it applies to. It would be ideal if all time zones followed these simple rules of naming and 1h time difference between them; but nothing is perfect. There are also time zones that have time differences of half an hour with respect to other world time zones. To make matters worse, some countries shift their time zones during summer for supposed daylight savings. These 'irregularities' complicate everything but also make this time zones converter even more useful. 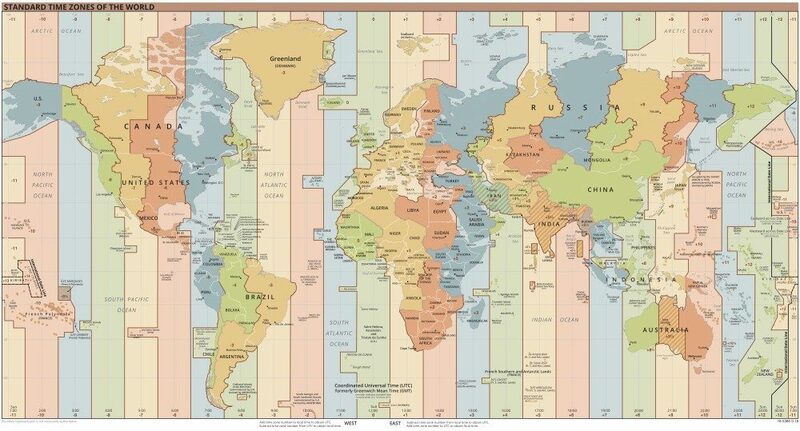 It is also useful to have on hand a time zones map (like the one below) not know more accurately what geographical region uses which time zone. If we would have to choose one time zone that stands out of the rest due to its importance, it would be the Universal Time Coordinated (UTC) time zone. This is the reference point for all other time zones. It's also referred to as Greenwich Meridian Time or GMT because it contains the 0th terrestrial meridian that passes through Greenwich. This time zone includes places like Great Britain, Portugal, Iceland and the north-west coast of Africa (Morocco, Mali, Ghana...).Hence, it is the reference time zone in this time zones converter. The UTC time zone is the reference for the names of all other time zones in both the time difference and the military naming schemes. The time difference is referenced with respect to the GMT/UTC time zone with all the world time zones having an increasing negative difference (-1h, -2h, -3h...) to the west and an increasing positive time difference to the east (+1h, +2h...). On the other hand, military time zones start with the letter A assigned to the UTC+1 time zone (CET) and moves up the alphabet to the east until the letter M and then assigns the letter N to GMT/UTC time zone and goes up the alphabet to the west up to letter Y. Another important time zone (or rather a time zone division) is the so-called International Date Line (IDL) which is located in the Pacific ocean and marks the separations between one day and the next. It is on the opposite side of the Earth to the Greenwich meridian and crossing this line means literally changing the date. IST [GMT+5:30] Indian Standard Time - India's own time zone. NPT [GMT+5:45] Nepal Time - Nepal's own time zone. NST [GMT-3:30] Newfoundland Standard Time - Newfoundland Island's own time zone. When using the time zones converter, there are a couple things that can be helpful. First of all, for simplicity, only a few time zones are shown by default in the time zones converter, but if you click on Advanced Mode you will be able to see all existing time zones as well as summer time zones for these countries which have daylight savings time. 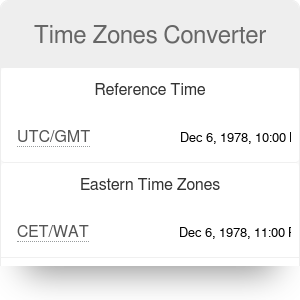 It is also interesting to know that hovering the mouse over the time zones in the time zones converter will bring up a small help dialog with basic information about the time zones in question. Álvaro Díez - PhD candidate. Time Zones Converter can be embedded on your website to enrich the content you wrote and make it easier for your visitors to understand your message.